Andy just sent me the photos from our weekend in Avalon – I think Mac took these? Â Thanks, Mac! Uncle Lee with a K, Andy, and part of ken... outside the ice cream shop. such an awesome moment. we conquered! I was writing someone about our trip yesterday and was going back through the blog… I really miss exploring a new place every day and riding so many miles all the time. Â I just rode from Atlantic City to Avalon this morning… a whopping 26 miles. Â Still loads of fun, though – especially with the wind at my back. It has been a perfect weekend in Avalon.Â The weather couldnt have been better – okay, maybe a little less wind..but it was fantastic. The guys had never really surfed before, so I tried to give them some basic instruction and send them into the ocean.Â My dad is a big surfer and I tried it for a while when i was younger… I helped as much as I could from the shore.Â Not the best waves for surfing, but they did really well for their first time. They finally decided they had enough and just jumped in the ocean. Â It was a really beautiful evening. Cyclists seen running into the Atlantic Ocean in full gear!!! So, I feel like i’ve learned a lot on this trip, about loads of things – including ken and andy. Â but, seeing them with their fathers and talking with Don, Patti and Mac a bit more about their perspective on our experiences and such.. well, i learned a lot more. Â We stayed with Ken’s mom, Patti and she made us an incredible breakfast in the morning. Â Ken’s parents both had to work, so Mac took us around all day to see the sights in Easton. Â We saw the Crayola Factory and learned that you’re not supposed to go in there unless you’re 6yrs old or have a 6yrd old, but it was still fun. Â Then to counteract this, we went to the Yuengling Brewery in Pottsville and drank and learned about beer. Â It is the oldest privately owned brewery in the country. Â Then we all went to Don’s house for a lovely dinner and grappa tasting. Â Have you had Grappa? Â No… well, its an experience, that’s for sure! The next day we had coffee with Mac and got back on the road. Â Thank you for everything, Mac, Don and Patti!! In easton, we were only about 75 miles from home sweet home, but none of us wanted to go back to the city without a nice weekend on the jersey shore…so we headed south. Â The ride along the delaware river was beautiful and we stopped at Ken’s friend’s place on the way for a delicious, very filling lunch. Ken’s friend John really wanted us to stay with him, and if were weren’t so determined to get to the beach, it would have been a perfect place to stay! Â We continued on to the Burlington-Bristol bridge into NJ… no bicycles aloud.. Â that didn’t stop us. Â Nor did it stop ken who got a flat tire the moment we started sprinting over the bridge. Â We gave the bridge guards/police plenty of time to ticket us, becuase as at the bottom of the bridge was the welcome to NJ sign and ken sat there and changed his flat.. so it couldnt have been too big a deal for us to cross there. Â We rode a few miles further into Mt. Holly (no, not a mountain, there is a hill that goes up about 4 feet, thats about it) and found a bar to sit and have a beer. Â At the bar, I asked our bartender if he had any idea where we could camp… anywhere at all, even behind a gas station would do. Â We were tired and this town was not one that would have camping. Â Well this guy, James Diamond, generously offered his backyard and boy were we thrilled. Â He still had to work, but we went to his house and knocked on the door to meet his parents Carolle and Joseph Diamond – they gave us a very warm welcome. Â Insisted that we come inside, offered the shower and opened up their house to us. Â We set up our tent inside and when i came in to say thank you and use the bathroom, they explained that they had to be at work at 6am, but they would leave coffee and breakfast for us and please do not go out and spend money. Â Geees, so nice!!! Â We woke up, drank a pot of coffee, cooked some eggs, cleaned up and got back on the road. Â Thank you so much, Diamond Family. Â It is so nice to experience such generosity on the east coast. We were all anxious to get to Avalon and so we made great time, even into a pretty strong headwind. Â I grew up in Syracuse, NY but have been spending my summers in Avalon since I can remember. Â After a few years of renting, my parents bought a perfect little house near the beach and we have been coming here since. Â My brother and I have lived here together over past summers and this year, my two youngest sisters live and work in Avalon. Â So when we arrived at 1:30 in the afternoon, we went straight to my sisters ice cream/candy store to say hi and of course, eat ice cream and candy. Â As we’re standing there talking to my youngest sister, Rory, Andy gets a call from his dad saying that he and his Uncle Lee are 4 blocks down the street!! Â What an awesome surprise.. they met us in Avalon and thankfully took photos when the three of us ran down to the ocean and jumped into the water (in full cycling gear). Â It was the greatest moment. Â Felt soo good to jump in the water and to know that we have officially made it to the other side of the country!!!!!!!!!!!!! Â Another 150 miles to brooklyn, but that’s just some extra… ‘cus we MADE IT! The rest of the evening was spent drinking beer on my porch with Mac and Lee and my two sisters. Â Umm, my sisters were definitely not drinking because they are not 21! Â And we ate another incredible, grilled dinner made by Andy. Thanks everybody!! Â We’re going to relax in Avalon for the weekend and then head home. The entire city of Dayton, in anxious anticipation of the return of its prodigal son and most famous Team QAKer, twoarmpartier and Trackstar, took an enormous, simultaneous breath, creating an eastern vacuum that pulled us out of Indiana with great haste. Our tailwinds hadn’t been that helpful since somewhere in Wyoming. With the flatness and short, 45-mile distance of our ride, we were back to Andy’s roots by 1:30 in the afternoon with time to stop at the fireworks store for a half hour along the way. Again, we are relaxing for a while, waiting for our muscles to atrophy before we punish them in Pennsylvania. We’ll probably see some movies and we’re definitely watching our friend Brett get married. Shortly after we leave the monday after next, several of our friends will pass us like silent trains in the northern night of Ohio as part of the Bicycle Film Festival’s 42Ride. 42 riders are leaving from New York & ending up in LA over 42 days with no rest days and they’re getting paid to do it for some reason. The message here is, again, Vodka. They’re sponsored by Vodka. You must drink more Vodka. As we’ve proven, it’s good for you. We know a couple people on this ride. Of Kennedy, Doug, and Corey the Courier, Kennedy is the only novice tourist, just like us. Good luck to all of you. Yaaawwn… snrgxxz…huh? What? OK! OK! We’re riding again! Rest days seem to be our best friends right now. We took a long weekend in Milwaukee, even though it hurt Quinn and me, and wasn’t always that *restful*. Since Tuesday, we’ve been in Chicago. What day is it? Friday? Yeah. I guess it is. We’ve cranked out a stellar 100 miles over the past six days and spent most of yesterday watching movies or old Simpsons episodes. Is twoarmparty slipping? Are we giving up? Balderdash! How could you possibly suggest we give up? After we’ve pulled off multiple back-to-back centuries, climbed the rockies, braved the perils of South Dakota, roughed it out in Iowa, and navigated the woody mazes of Wisconsin? It’s not US that gives up when we get to Chicago. It’s those OTHER friends of ours from last summer, and they started on the EAST coast. That’s the SHORT way to Chicago. We’re just hanging out. It’s been tough. Dumptruck. This is the name he goes by. Image from Gus Legit. This is a good time to give our thanks to Brean. Hey Brean, thanks. For letting us stay at your place for three nights, watch all your roommate’s DVDs while it rained, and meeting us in Kenosha to guide us into Chicago. We’ll never forget you. Come back to New York. Don’t just say it, do it finally. And good luck with the kids you’re coaching out at the track. Oh wait! I totally forgot to explain why we’re wasting so much time. It’s because we’ve got time to waste. The next place we have to be is in Dayton, Ohio, and we need to be there by next Friday. It’s less than 300 miles away, and we can easily make it there by Tuesday. So instead of pushing boring, 30-mile days through cornfields and Gary, Indiana (which is not nearly as nice as the song from the Music Man leads one to believe), we figured we’d hang out in the windy city and visit our friends. So there you go. That’s why we’re here. This weekend, I woke up more sore than on any other day during the trip. My knees hurt to bend and my ankle hurt to walk on. Jumping right back on a brakeless fixed gear bike weighing 1/5 the weight of my fully loaded touring bike and sprinting back & forth all day long in the rain didn’t come with as much ease as I might’ve expected it to, having powered nearly three thousand miles by this point. Quinn & my polo bikes were stored by friends in New York, and shipped out here for the tournament. They’re both fixed gear bikes. A good number of the people reading this blog know what that means, but for the rest of you – our moms’ friends, the ladies at Curves, maybe a few lurkers who haven’t left comments – it means that the bike only has one gear, no brakes, and doesn’t coast. To slow down and stop, you pedal slower or lock up your legs to completely stop the rear wheel from turning. It works an entirely extra set of leg muscles than riding a “normal” bike because stopping the bike requires applying resistance to the pedals’ constant forward motion. Sure, Quinn and I have worked the crap out of all the other muscles, but the fixed gear muscles had been more or less dormant for the past two months. Then we go and hurl ourselves into round-robin competition using them. I personally hurt a lot Sunday morning. It probably didn’t help that I fell on my knees & ankle once or twice – and the half-bottle of vodka I shared with my teammates before the last match of the day probably didn’t improve my coordination either. These idiots also showed up. 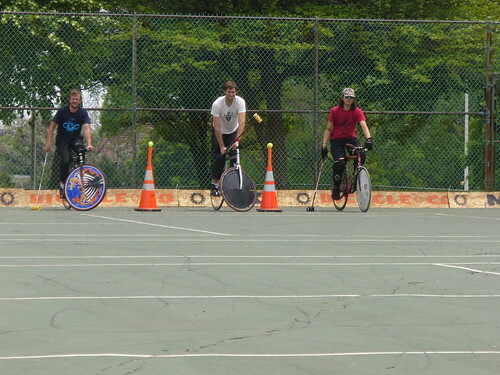 If you haven’t watched their videos, you don’t understand bike polo. My team’s Saturday win/loss ratio suffered. 1-6-2, I believe. One of the two ties was 0-0 with a Chicago team. Disappoinment all around. The other tie, we TRIED to lose 0-5 like most of the rest of our matches, but Ch0mb0 kept scoring goals! WTF!? Our one win came against Quinn’s team, “Ladies”, made up of herself, Birdie from Madison, and Amandaconda from Tampa/Seattle. Quinn’s brother, Jarrett, by the way, is on my team. No mercy. Another good lesson we learned is that we tend to play better sober and maskless. We did much better on Sunday. Yet another valuable lesson learned is that we’re great dancers. Watch this video! Here’s a caveat – you have to lay down or turn your entire computer sideways to watch it, and imagine there’s music playing. It’s got a fantastic ending. People come out of the woodwork for these things, especially the well-sponsored and hyped events. Sven, Kat, Dustin, and Sue I met in Minneapolis; Ben Hunter, Johnny Hunter, Birdie, Jill, Pierre (from France as of a few months back) and Sam from Madison; Jason from Baltimore; Jarrett, Ch0mb0, Doug, Paul, Bad Zach, Good Zach, Red Chris, Johnny Midwest, Adam Ackbar and Cecily from New York; Amandaconda from Tampa/Seattle; Sea Bass & Leon from Seattle; Lucky from St. Louis; Alexis from Ottawa who’s Canadian teammates backed out at the last minute and left him with Sea Bass & Leon (they came in 2nd place); Rory, Gentleman James, and Pieter from East Vancouver; Gus, Jav & Nick from Boston; Nick, Ben, and Ian from Richmond; Ben, Dumptruck, Joe, Tucker and Brian from Chicago; all those kids from Portland whose names I forgot. There are names I’ve unintentionally omitted, and for that I apologize. And too many names from Milwaukee to recall – except for Jake and Kremin, who orchestrated the entire event with near flawlessness. Well done, in spite of the disagreeable weather and less-than-expected attendance, guys. This is a good time to express our gratitude to Ben’s Cycle/Milwaukee Bicycle Company. One of the two main sponsors of the event, they also accepted the shipment of our bikes from New York, and had no apparent qualms with us loitering in the back of their shop for hours unpacking and assembling them. COG Magazine, the other major sponsor, made it possible to coordinate 22 teams into a two-day round robin/double elimination tournament on three handmade courts. Before competition even began, Tucker from Chicago cracked two of his teeth in half after an errant mallet swing collided with his face. International polo medic Johnny Midwest leapt onto the scene of the carnage with aplomb, and Jarrett somehow found the teeth fragments on the surface of the refashioned tennis courts. Tucker fortunately lives a mere hour’s drive away, and his nearby family came to shuttle him to some emergency dental work. Polo can be a dangerous sport. As if it doesn’t take enough coordination to maneuver a bicycle while weilding a mallet and trying to hit a ball through a goal, you have to do this while five other cyclists swerve, twist and sprint, trying to do the same thing. Crashes are inevitable, and there are few rules prohibiting defensively rough play. Bike Polo is a contact sport. Even the spectators are often at risk. Andy’s Mom, for instance, took a mallet to the face from Jarrett. Andy has given me free license to exaggerate the retelling of this event, but it’s good enough in real life to not have to. Andy’s family lives across Lake Michigan. They ferried to Milwaukee for the weekend to meet twoarmparty and observe the polo. Tournaments, unfortunately, are all-day events, and they never got to take us out for some one-on-one dinner time. On Sunday, they came with sandwiches for the day and cookies for the trip. Quinn & I took a break from the crowds to hang with the family. As Jarrett walked up to play a game of pickup on the adjacent court, Quinn introduced him as her brother. At this exact moment, Jarrett was hurling his mallet onto the court. He missed. Instead, as it left his hand, it caught on a part of the plywood wall and redirected itself towards Andy’s Mom’s face, Jarrett’s hand extended in an expectant handshake. WHAM!!! In slow motion, this moment is spectacular. Andy’s Mom staggers back. Jarrett’s handshake turns into two hands covering his face in horror and humiliation. Quinn is mortified. Andy is in shock. I can’t believe that just happened. Bystanders shake their heads humorously, wondering how Jarrett can make this ok. He really can’t. Andy’s Mother was fine. No cuts, no scrapes, no shattered teeth or broken glasses. Jarrett only got that one chance to make that first impression, but he went as far away as he could afterwards to play his game. Well done, Gigante. Gigante smash! Sunday’s weather was far more forgiving than the cold, intermittently rainy Saturday. As teams got eliminated from the bracket, more kegs were tapped and more courts were opened for pickup. The sun brought out more babies & dogs than I’ve seen at any other tournament. Our friend Roxanne brought out her baby, Mabel, who’s one of the most adorable babies the midwest has ever seen. And that’s saying a lot, since it seems an apparent requirement to have a baby out here. Like they give you one for signing a lease. That’s Nan, Ben Hunter’s daughter. She’s teaching me how I can become a fairy. (Photo by Gus). We stayed with Roxanne & Mabel Monday night after packing our bikes back up and saying goodbye to our friends. It was far more comfortable than my Sunday night slumber party at Kremin’s, sleeping next to Nick from Boston, who accurately warned me that he snores loud. While a party went on around us and he snored, I struggled to sleep on a dusty matress with no pillow or blanket. It was raining too hard for me to go back to the hotel, and my phone had died (more than just the battery) so I had no way of getting back into the room at this hour anyway. I wandered downtown Milwaukee in the morning and found some girls handing out free Stone Creek Coffee in honor of Bike To Work Week. I gave them our blog and explained Bike Polo to them. We saw them again the next day in front of the Stone Creek coffeeshop on our way out of town. It was a good time taking some exhausting rest days in Milwaukee. We reconnected with people we’d met along the way, and saw some of our best friends for the first time in months. One of them in particular was impressed with how good we’re starting to look. I think he has a crush on me now…which is actually kinda disturbing. But flattering of course. Everyone was happy to see us and tell us how much they enjoy following us on this blog. We’ll see you soon guys. Thanks for a great weekend. two.arm.party is powered by	WordPress 3.3.2 and delivered to you in 0.219 seconds using 40 queries.